When Andrew first pitched the idea of putting together this public forum on sport history, I was hesitant to join. The idea of publicly sharing things that I’ve written has always given me an irrational fear, a feeling that I’m standing in front of a room in my underwear. However, the chance to work with such talented scholars deeply interested in sports and its larger cultural role in our world was too good to pass up. As many of you can attest, being a sports fan can be a lonely experience in graduate school. I can count on my fingers and toes the number of times my cries for relief from Tony Romo’s nightmarish fourth quarter meltdowns have been met with blank stares from my colleagues. Like they say in the Baptist church, it is “good to be in the number.” This post marks a reunion of sorts. After a slight intellectual detour to examine student activism in South Carolina, it excites me greatly to resume study of the Cannon Street Y.M.C.A. All-Stars and their valiant attempt to desegregate Little League. Much of the credit for the team’s story going public belongs to the team’s unofficial historian Gus Holt, a tireless advocate for fairness and equity in youth athletics. The Post and Courier’s Gene Sapakoff, the late Margo Theis Raven, and the Charleston Riverdogs also deserve a tip of the cap for their support of the team. In keeping with this spirit, we have started a campaign to have the All-Stars invited to the White House. Here is a link to the team’s brand new website and online petition. Join the movement! On a gorgeous, sun-kissed late August afternoon, a capacity crowd of spectators gathered at Original Little League Field in Williamsport, Pennsylvania to witness the championship game of the 1955 Little League World Series (LLWS) between upstart, sentimental favorites from nearby Morrisville and a talented, resilient squad from neighboring Delaware Township, New Jersey. The climactic struggle of youth baseball’s annual summer showcase, broadcast to millions of households nationwide and beyond America’s borders by CBS, provided Little League with a powerful platform to impress viewers and continue the sport’s amoeba-like development into a global phenomenon. During the first decade after World War Two, Little League expanded from twelve leagues in a single state to more than 3,300 leagues in the United States, Canada, the Panama Canal Zone, and Mexico. Those privileged enough to watch the final game of the 1955 series were treated to quite a spectacle. 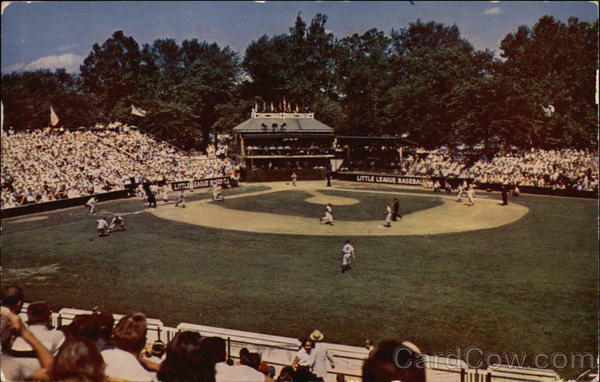 Original Field, a bowl-shaped emerald surrounded by lush forests, was a child’s “Field of Dreams.” The freshly painted red and yellow striped foul poles, a color scheme selected by local kids, shone like eagerly licked candy. Above the center field bleachers, a huge, white sign shouted to the world, “Welcome to the Little League World Series!” Adult volunteers and league officials added seriousness to the event. The pregame ceremonies, attended by dignitaries such as Pennsylvania Governor George M. Leader and the highly esteemed General George C. Marshall, were accompanied by more than the usual pomp and circumstance. Nearly every inch of the stadium was adorned with patriotic bunting. American flags danced to the tune of the national anthem played by Fort Dix’s 173rd Army Band. The two teams, momentarily forgotten amid the clamor, stood on opposing baselines. The boys, neatly attired in their freshly cleaned uniforms conspicuously emblazoned with the names of their native states and corporate sponsors, waited eagerly for their chance to emulate big league heroes such as Ted Williams and Joe Dimaggio. 88 year-old pitching icon Cy Young threw the ceremonial first pitch in one of his last public appearances before his death a few weeks later. It was a Rockwellian portrait of American athletic innocence, a sanitized and pristine homage to the nation’s postwar affluence and blinding whiteness. Original Little League Field at Memorial Park, Williamsport, PA. The Cannon Street YMCA All-Stars at the championship game of the Little League World Series in Williamsport, PA, August 26, 1955. 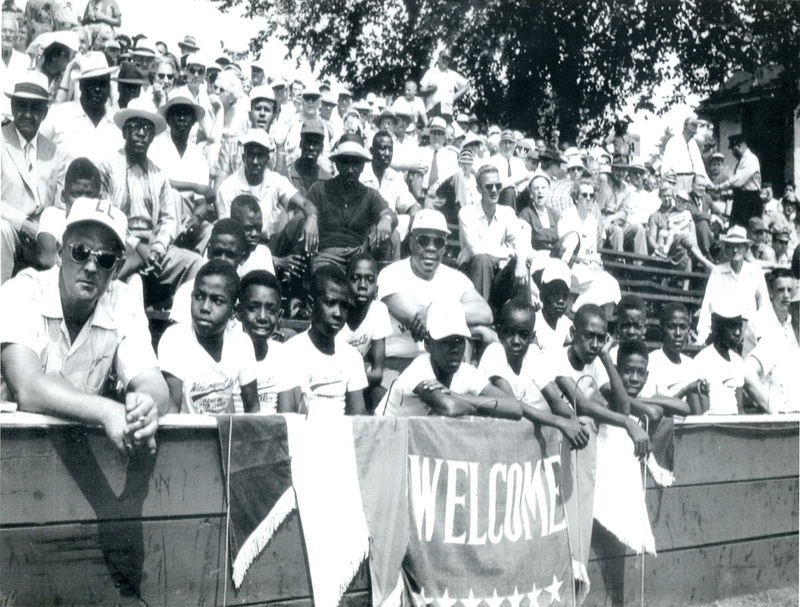 Huddled in the bleachers along the third base line, ironically near a large banner which read “Welcome,” were fourteen African American boys from Charleston, South Carolina whose experience in Williamsport belied Little League’s ironclad commitment to integrated play. Known as the Cannon Street Y.M.C.A. All-Stars, this team of 12-year-olds became embroiled in a racial controversy that forever changed youth baseball in the American South. Nearly 15 months after the Supreme Court ruled in Brown v. Board of Education that segregated schools were unconstitutional, black YMCA officials entered the team into the “whites only” Charleston Little League tournament. City recreation officials eventually canceled the event. Winners by default, the All-Stars prepared to compete in the South Carolina state tournament. In a show of “massive resistance,” white Little League officials, coaches, and parents gradually organized a mass boycott. The Cannon Street team was ultimately denied the opportunity to compete in the LLWS but was invited to attend the final game as guests of Little League president Peter J. McGovern. The following year, teams in seven southern states seceded from Little League and formed “Little Boys Baseball, Incorporated,” a segregated youth baseball organization that later became known as Dixie Youth Baseball. This “Civil War” within youth baseball, sparked by the Cannon Street effort, was a pivotal moment in the African American freedom struggle in South Carolina and the nation. 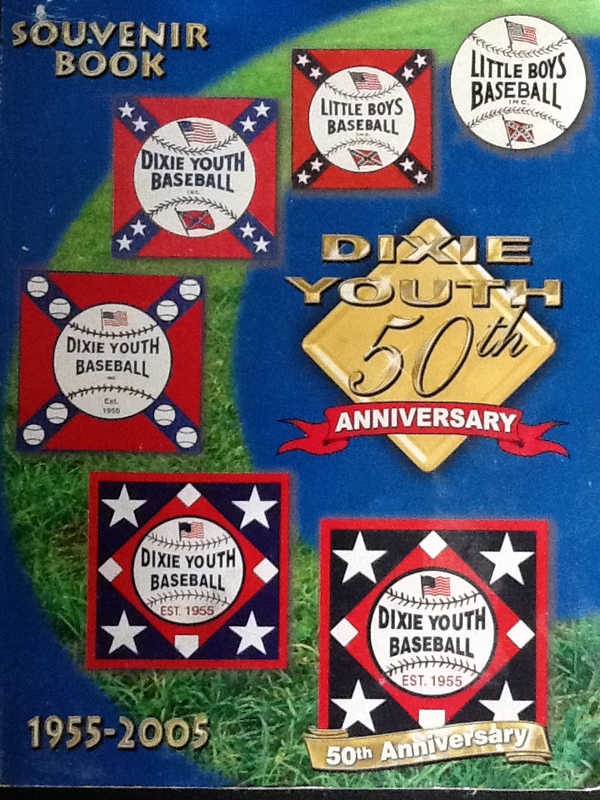 This is the front cover of Dixie Youth Baseball’s 50th Anniversary souvenir booklet which highlights its evolution from a segregated “whites only” league to its modern incarnation. Its authors recognize South Carolina as the organization’s birthplace but make no mention of the racial controversy that spawned it. This year marks Little League’s 75th anniversary and offers a timely occasion to remember the story of the Cannon Street All-Stars and ponder the paltry state of youth baseball in African American communities. Unlike its adult-centered counterpart, Little League’s official history lacks complexity and offers superficial analyses of racial and gender strife throughout its existence. The organization’s official website entitled “Little League, Big Legacy” includes a historical timeline and a series of vignettes featuring black professional ballplayers such as Brandon Phillips and Lloyd McClendon, each of whom share fond memories of their Williamsport experiences. Despite honoring the team in 2002, Little League makes no mention of the Cannon Street saga in its online history. This omission, honest or not, reveals much about Little League’s standing as a corporate entity that profits from its ability to meet a consumer demand–to sell youth recreation that reaffirms the myth of the level playing field and masks the hard realities of economic inequality and racial discrimination that have historically shaped both its imagined global neighborhood and its real suburban ones. Similar to Major League baseball, where only 8.3% of players on opening day rosters were black, Little League has largely failed to reach kids in predominantly black communities. Most blame hip-hop culture, the astronomical rise in single parent households, and the easy access and instant gratification found in other sports for the decline in black participation. While these are all valid reasons, they place more of the blame for the sports’ decline on those without resources and access than the governing bodies that control the sport both internationally and in local neighborhoods. In parts of the South affected by “Little League’s Civil War,” to what extent do hard feelings, racial stigmas, black poverty and modern-day gentrification serve as an additional burden dragging down baseball’s prospects for recovery? In my next few posts, I will break the silence surrounding the desegregation of youth baseball; examine the role of Little League in America’s postwar liberal project; and address the impact of this historical legacy on African American participation in the national pastime. Ramon Jackson is a doctoral candidate in History at the University of South Carolina. Follow him on Twitter @RmJackson13 or reach him by email: rmjackso13@yahoo.com. 10 July 2014 in Ramon Jackson. I think this is a very interesting story and pivotal point in history. As a native of the Charleston area it is nice to see this story told with such eloquent wording. I look forward to the next installment. Thank you for this, Ramon — powerful & fascinating. I can’t say too much, considering I’m familiar with a good deal of your research here–but I’m definitely looking forward to the next series of posts! Ramon Jackson has posted an article at Sport in American History blog on the Little League Canon Street Y.M.C.A. All-Stars from South Carolina. Formed a year after Brown v. Board of Education, the Canon Street All-Stars entered the Charleston Little League Tournament. In response, Charleston City officials cancelled the tournament. Even though the Canon Street All-Stars were declared champions of the tournament, South Carolinians ultimately barred the Canon Street All-Stars from competing in the state tournament. In response to these actions, the President of Little League., invited the team to the final game of the Little League World Series. Ultimately, southerners started their own segregated league Little Boys Baseball, Inc. to replace Little League. Jackson’s article commemorates the 75th anniversary of Little League. It’s a fantastic article. Very enjoyable piece, looking forward to future installments!